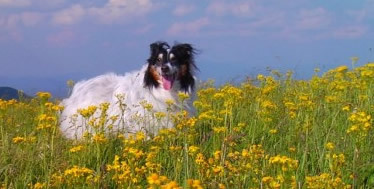 This poignant, comforting Dog Pearl reflects a vivid vision that Little Pearls’ Executive/Creative Director Linda had of her older dog Katie, shortly after Katie’s death in March 2008. 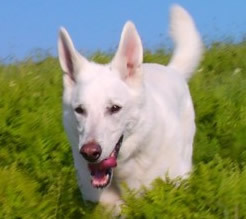 In the vision, Katie was running joyfully, free and without limits, on a green mountain ridgeline. The first photo here is of Katie’s best friend Mitch, standing in for her. Coming Home is the first of a series of Dog Pearls. 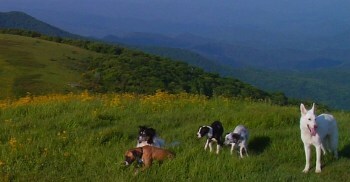 It features five dogs filmed in HD on a beautiful mountaintop bald in the Blue Ridge Mountains, June 2008. These dogs are members of three different families, not trained professionals. They did not all know each other, yet they had so much fun together, running loose and playing on a glorious day in the mountains! Coming Home from Little Pearls on Vimeo. Please play in HD if you can! Coming Home was created simultaneously with Spirit Dog. Each of these Pearls is approximately one minute long. They are poignant, comforting and spiritual. They address living – and dying – with ease, love and grace. 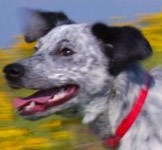 These Dog Pearls are meant to encourage adoptions; a closer bond between humans and animals; and a sense of what we have in common with companion animals in so many life experiences. 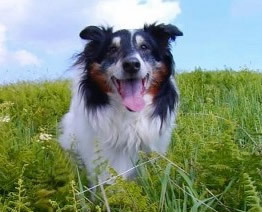 They are about what dogs teach us, in terms of being human, as much as they are about dogs themselves.